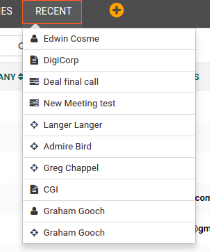 You can add a new Contact, Account, Opportunity, Activity from any page in ZipperAgent by clicking on the quick add icon, available at end of the header menu. This shortcut is available as a Plus icon just before the header search box. ZipperAgent maintains a list of last ten unique records that you have viewed or worked upon and provides an easy to view list of those records, maintained chronologically on the menu bar. This shortcut is available with a link to “Recent” just beside the Quick Add icon. You can see the list from any page in ZipperAgent and refer to those records easily. Initially when your start your user account, this list will be empty, but as and when you work on several different objects, the list will get populated.